Rinse quinoa under cold water 1 minute; drain. In 2-quart saucepan, heat quinoa and broth to boiling; reduce heat. Cover and simmer 15 to 20 minutes or until quinoa is tender; drain. Cool completely, about 45 minutes. In large serving bowl, toss quinoa and remaining ingredients. Serve immediately, or refrigerate 1 to 2 hours before serving. 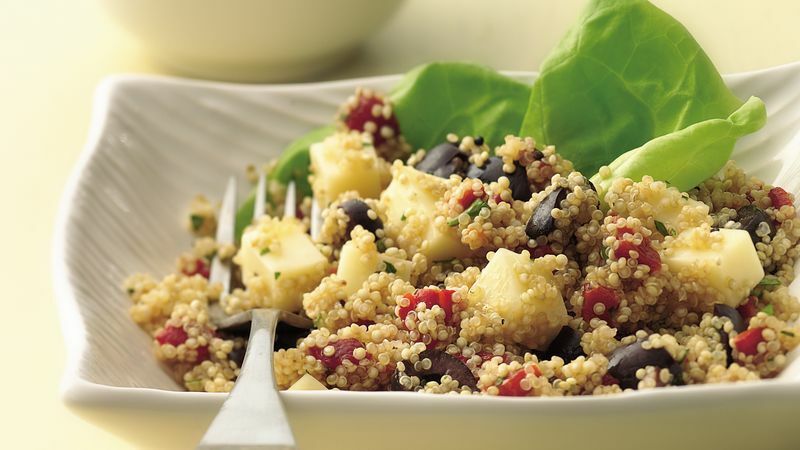 Quinoa is a popular grain in South American cuisine and is gaining popularity in the states. Its nutrition profile is impressive because it is a complete protein. Cooking grains in chicken broth or vegetable broth adds to the overall flavor of the dish. You can also cook the quinoa in 2 cups water with 1/2 teaspoon salt. Serve a scoop of this savory salad on a lettuce leaf. Add a slice of crusty French bread and 3/4 cup of fresh raspberries for dessert to raise the Carbohydrate Choices to 3 1/2.